Cognitive-behavioral interventions are the most extensively researched form of psychological treatment and are increasingly offered through the Internet. Internet-based interventions may save therapist time, reduce waiting-lists, cut traveling time, and reach populations with health problems who can not easily access other more traditional forms of treatments. We conducted a systematic review of twelve randomized controlled or comparative trials. Studies were identified through systematic searches in major bibliographical databases. Three studies focused on patients suffering from pain, three on headache, and six on other health problems. The effects found for Internet interventions targeting pain were comparable to the effects found for face-to-face treatments, and the same was true for interventions aimed at headache. The other interventions also showed some effects, although effects differed across target conditions. Internet-delivered cognitive-behavioral interventions are a promising addition and complement to existing treatments. The Internet will most likely assume a major role in the future delivery of cognitive-behavioral interventions to patients with health problems. Cognitive-behavioral interventions are probably the most extensively researched form of psychological treatment (Butler et al. 2006). Cognitive-behavioral interventions are aimed at challenging negative automatic thoughts and dysfunctional underlying beliefs, and at changing behavioral patterns which are related to the problem being targeted in the therapy. More than 300 published controlled outcome studies, and probably many more, have examined the effects of cognitive-behavioral therapy (CBT) for a wide range of disorders and health problems, ranging from mental health disorders, such as depression (Hollon et al. 2002), anxiety disorders (Barlow 2002), schizophrenia (Pilling et al. 2002), to health conditions such as chronic pain (Morley et al. 1999), sleep problems (Morin et al. 1999), headache (Holroyd 2002), cancer (Moorey and Greer 2002) and many others. Most of these studies have shown that CBT has positive effects on these and several other health conditions. CBT is not only the most extensively researched form of psychotherapy, but also the most widely applied type of psychotherapy (Norcross et al. 2005), and certainly the most widely applied ‘evidence-based’ type of psychological therapy. CBT is increasingly offered through the Internet. Internet-based interventions may have several advantages over other more traditional forms of delivery. They may save therapist time, reduce waiting-lists, allow patients to work at their own pace, abolish the need to schedule appointments with a therapist, save traveling time, reduce the stigma of going to a psychologist or therapist, and facilitate help for the hard-of-hearing as self-help treatments typically work with visual rather than auditory information (Marks et al. 2007). Furthermore, Internet-delivered self-help may be programmed to enhance patients’ motivation by presenting a wide range of attractive audiovisual information with voices giving instructions in whichever gender, age, accent, language and perhaps game format the client prefers. It can also quickly and automatically report patient progress and self-ratings. Internet-based interventions may reach populations with health problems, who can not be reached with other more traditional forms of treatments. For example, a considerable proportion of the patients with mental disorders are not reached with traditional forms of treatment (Bijl and Ravelli 2000) because of the stigma associated with mental disorder, prejudices about therapists, lack of willingness to talk to a stranger about personal problems, or because of physical obstacles like walking problems or long distances. For patients with somatic conditions there may be barriers to seek psychological treatment. Internet-guided interventions may reach a segment of this population who cannot be reached through traditional interventions. Internet-based psychological interventions for many health problems are commonly based on CBT techniques. One reason is that the effects of CBT have been shown in numerous trials. Another reason why CBT is often used in internet-interventions is that these techniques lend themselves to be operationalized in text. CBT interventions can very well be converted into a structured format, with psychoeducation, homework assignments and registration exercises presented via web pages (Ritterband et al. 2006). Delivering CBT through the Internet does not, however, only have advantages. An online programme may not be suitable for technophobic patients and illiterates, nor can it answer all the possible questions users may ask; it can not detect subtle nonverbal and verbal clues to clients’ misunderstandings; it may encourage clients to cherry-pick from a range of homework options presented; and not all clients find communicating via computers acceptable (Marks et al. 2007). However, subtle text nuances may be detected and somewhat surprisingly, Internet interventions has been found to generate good working alliance between the patient and the therapist (Knaevelsrud and Maercker 2006). Furthermore, it is not yet very clear whether CBT interventions which have been proven to be effective when delivered in traditional format, are also effective when delivered through the internet. Recent studies, however, indicate that this might be the case for at least some patients and some conditions (Carlbring et al. 2005). Whether or not an internet-based CBT is effective should be examined in randomized controlled trials, and can obviously not be based on the effects of traditionally delivered CBT (e.g., individual or group format). Since the Internet has become available to the broad public in many Western countries, several trials have examined the effects of cognitive behavioral interventions in randomized trials. In a recent meta-analysis, we examined the effects of internet-based treatments for depression and anxiety disorders, and found that these interventions had large effects (Cohen’s d = 1.00) compared to control conditions, when some kind of guidance was given to the patients receiving the treatment (Spek et al. 2007). This latter observation was also confirmed in a recent review in which a correlation of rho = .75, P < .005 was obtained between amount of contact spent with clients and the effect size (Palmqvist et al. 2007). These large effect sizes suggest that Internet-administered CBT is as effective as face-to-face CBT, and that the format in which CBT is delivered may not be related to the effect sizes found. It is not known, however, whether Internet-administered CBT is also equally effective when other health problems are targeted. In the current study, we will present the results of a systematic review of Internet-delivered CBT for health problems. In the review, we aim to establish for which health problems Internet-based CBT has been developed, and examined in randomized controlled or comparative trials, and whether these interventions were effective. We also examine the target groups and contents of these intervention, as well the quality of the studies. Studies were traced through several methods. First, we conducted a comprehensive literature search in bibliographical databases (from 1966 to February 2007). We examined 1,608 abstracts in Pubmed (295 abstracts), Psycinfo (109), Embase (330) and the Cochrane Central Register of Controlled Trials (374). In order to find unpublished studies, we also searched Digital Dissertations (500 abstracts). We searched these databases by combining terms indicative of effect studies (randomized trials, controlled trials, clinical trials) and Internet (both keywords and text words). Second, we examined the references of earlier reviews of Internet-based interventions (Griffiths et al. 2006; Wantland et al. 2004), and we reviewed the reference lists of retrieved papers. 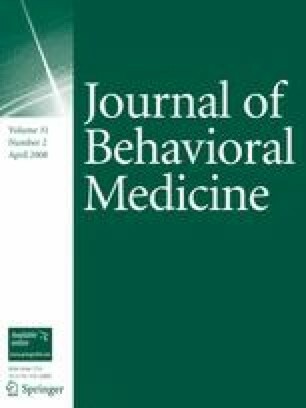 Studies were included if they met the following criteria: (a) randomized controlled or comparative trials (b) examining interventions that were conducted through the Internet (at least 50% of the intervention), (c) based on CBT techniques, (d) aimed at behavior change (e) in patients with an existing disorder or health problem. We excluded studies aimed at mental disorders, because another recent systematic review was published about these studies (Spek et al. 2007). We also excluded studies focusing on lifestyle (smoking, obesity, exercise, nutrition), because the character of these interventions differs strongly because the focus of these interventions is typically preventative. There are at least 25 scales available to assess the validity and quality of randomized controlled trials (Higgins and Green 2005). There is no evidence, however, that these scales provide more reliable assessments of validity. We preferred therefore to use a simple approach for assessing the validity of the studies, as suggested in the Cochrane Handbook (Higgins and Green 2005). In this context, the validity of a study can be defined as the extent to which its design and conduct are likely to prevent systematic errors (Moher 1995). Variation in validity can explain variation in the results of the studies included in a systematic review and may result in an erroneous conclusions that an intervention is effective if the less rigorous studies are biased toward overestimating an intervention’s effectiveness (Higgins and Green 2005). We assessed the validity of the studies using four basic criteria: allocation to conditions is conducted by an independent (third) party; adequacy of random allocation concealment to respondents; blinding of assessors of outcomes; and completeness of follow-up data. We examined the characteristics of the target populations, the interventions, and the design of the included studies. We also examined which main outcome measures were used for each study, and we calculated standardized effect sizes for each of the main outcome measures. These effect sizes (d) were calculated by subtracting (at post-test) the average score of the control group (M c ) from the average score of the experimental group (M e) and dividing the result by the average of the standard deviations of the experimental and control group (SD ec ). An effect size of 0.5 thus indicates that the mean of the experimental group is half a standard deviation larger than the mean of the control group. Effect sizes of 0.8 can be assumed to be large, while effect sizes of 0.5 are moderate, and effect sizes of 0.2 are small (Cohen 1988). When sufficient effect sizes were available (at least three effect sizes examining the same outcome measure in the same health problem), we calculated pooled mean effect sizes. For these analyses, we used the computer program Comprehensive Meta-analysis (version 2.2.021), developed for support in meta-analysis. As we expected considerable heterogeneity, we decided to calculate mean effect sizes with the random effects model. In the random effects model, it is assumed that the included studies are drawn from ‘populations’ of studies that differ from each other systematically. In these analyses, we tested whether there are genuine differences underlying the results of the studies (heterogeneity), or whether the variation in findings is compatible with chance alone (homogeneity; Higgins et al. 2003). As an indicator of homogeneity, we calculated the Q-statistic. We also calculated the I 2 -statistic which is an indicator of heterogeneity in percentages as well. A value of 0% indicates no observed heterogeneity, and larger values show increasing heterogeneity, with 25% as low, 50% as moderate, and 75% as high heterogeneity (Higgins et al. 2003). A total of 61 papers which possibly met our inclusion criteria were retrieved. Twelve studies (13 papers; two papers were published about the same study) met our inclusion criteria. The other studies were excluded because they did not examine a cognitive-behavioral intervention (30 papers), because they were not a randomized controlled or comparative trial (11 papers), or because they did not examine an Internet-based intervention (7 papers). Selected characteristics of the target groups, the intervention, and the general design of the twelve included studies are presented in Table 1. Psychoeducation; applied relaxation; positive imagery; advice on noise sensitivity; cognitive restructuring; behavioral sleep management. Psychoeducation on communication; self-observation, role-playing, confrontation, positive verbalizations; social skills and assertiveness. In the twelve included studies, a total of 1,704 patients participated, 841 in the Internet-CBT conditions, and 863 in the control conditions (mean number of respondents per study: 142; standard deviation: 258.7). More than half of these 1,704 patients (56%) participated in one study (Lorig et al. 2006). In none of the other studies was the number of patients per condition larger than 64. Eleven studies compared an Internet-based CBT intervention to a control condition, while one study compared two types of Internet-based CBT to each other (one with and one without weekly telephone calls). Nine of the eleven controlled studies used a waiting list control group, while one study used a care-as-usual control group, and the other one used an information control group. In all studies, participants were randomized to one of two conditions. In none of the studies was Internet-based CBT compared to a face-to-face intervention of another treatment. Six studies only presented pre-post data, while the other six also had a follow-up measurement (mean length of follow-up in these six studies was 7.67 months; standard deviation 4.76). Six studies were conducted in Sweden, four in the United States, and two in Canada. All included studies were conducted in the year 2000 or later (one in 2000 and another one in 2002, two in 2003, in 2004, and in 2005, and four in 2006). The quality of studies varied. Three of the twelve studies reported that allocation to conditions was conducted by an independent party. Concealment of random allocation to respondents was not possible in any of the studies, while blinding of assessors was reported in none of the studies. Drop-out numbers ranged from 2% to 61%. In only one of the studies intention-to-treat analyses were conducted (Hicks et al. 2006; the other studies were limited to completers-only analyses). Three studies focused on patients suffering from pain, three on headache, and six on other health problems (tinnitus; physical disabilities; chronic diseases; breast cancer; insomnia; and pediatric brain injury). In ten of the twelve studies, patients were recruited through announcements on websites, referrals, and community recruitment. In the other two studies patients were recruited through screening of clinical samples. Ten studies were aimed at adults, two at children. None of the interventions were aimed at older adults, although three studies allowed older adults (≥70 years) to participate. The other studies on adults only included younger adults for participation or did not report that they used an age limit. The character of the interventions differed from each other. One group of interventions consisted of self-help materials on the Internet, with supporting e-mails or telephone calls (5 studies). In two studies the intervention consisted of self-help materials on the Internet, but without the supporting e-mails or calls. In the other studies, the core of the intervention consists of online contact between a therapist or moderator and the patients (individual or in groups). Most interventions contained psychoeducation on the specific problem, and different CBT modules such as cognitive restructuring, relaxation techniques, and social skills training. The duration of the interventions ranged between 4 and 20 weeks. The effects of the interventions on the main outcomes of each included study at post-test are presented in Table 2. We pooled the three studies in which Internet-based CBT for pain was compared to control groups. The mean effect size on the main outcome measure was 0.58 (95% CI: 0.25–0.92; P < 0.001), indicating a moderate to large effect of the interventions compared to the control groups at post-test. Heterogeneity was very low (Q = 0.75, n.s. ; I 2 = 0). There were also three studies on headache, however one did not use a true control group (but compared two active interventions to each other). Therefore we did not pool the results of these studies. The effect sizes of these interventions were small (d = 0.19; Ström et al. 2000) to moderate (d = 56; Devineni et al. 2005). The effect sizes of the other studies were in the small to moderate range, varying from small (d = 0.10) for health indicators in chronic diseases at one-year follow-up, to somewhat larger for health-related quality of life in breast cancer patients (d = 0.22) and from tinnitus sufferers (d = 0.26), to moderate (loneliness in patients with physical disabilities; d = 0.46) and large (parental mental health in pediatric brain injury; d = 0.70). Most effect sizes did not significantly differ from zero because of the small sample sizes in the majority of the studies. This systematic review of controlled and comparative studies of Internet-based CBT for health problems showed that this field is developing fast. Since 2000, twelve randomized studies have examined interventions for pain, headache, and several other health problems. Half of these trials were published in 2005 and 2006, and it can be expected that the number of trials will rise sharply in the next few years. Overall, findings are promising but effects are slightly below the effect sizes found for Internet-delivered CBT for anxiety and depression (Spek et al. 2007). Although several health problems were targeted in these Internet-based studies, there are gaps in the literature in terms of treatments for health problems which have been found to improve by means of CBT. For example, several studies have examined the effects of CBT for chronic fatigue syndrome (Knoop et al. 2007), fibromyalgia (Garcia et al. 2006), incontinence (Garley and Unwin 2006), or multiple sclerosis (Thomas et al. 2006), but these have not yet been transformed into a web based intervention, although trials found positive effects of face-to-face CBT for these problems. Because the promising results of earlier studies, and because of the benefits of Internet-based interventions, we can expect development of new programs for these conditions in the future. Our review does not cover the whole field of internet interventions. While we focused on CBT for existing health problems, several other studies have examined CBT for mental health problems (Spek et al. 2007), on internet-based preventive interventions aimed at a healthy lifestyle (weight loss, smoking, exercise; e.g., Swartz et al. 2006; Muñoz et al. 2006; Oenema et al. 2001; Tate et al. 2006), and interventions using non-CBT methods (McMahon et al. 2005; Edwards et al. 2006; Gray et al. 2000). However, as was shown in this review, research on CBT interventions has been growing fast in the past few years. Because CBT interventions are very well suited to be used through the internet, it can be expected that research in this area will continue to grow further in the next years. The included studies do not yet allow us to draw definite conclusions about whether CBT through the Internet are as effective as face-to-face interventions. For most health problems we found only one study examining the effects of an Internet-based CBT study. In fact, it was only for pain and headache did we find more than one studies. However, the effects found for Internet-based interventions aimed at pain are comparable to the effects found for face-to-face treatments for pain (Morley et al. 1999), and the same is most likely true for the Internet-interventions aimed at headache (Bogaards and ter Kuile 1994). The other interventions also found some effects, although some effects were stronger than others. It does seem clear, however, that Internet-based CBT can have significant effects on some of the health problems described in this review. For at least one of the conditions—tinnitus—an effectiveness study has been published showing better results then the first controlled efficacy trial (Kaldo-Sandström et al. 2004). It has been suggested self-help interventions be used as one of the first steps in stepped-care programs (Scogin et al. 2003). Perhaps Internet-based interventions which are used in healthcare settings should also be placed within these stepped-care frameworks. In these cases, additional care is available if the Internet-based intervention does not reduce the problem of a patient sufficiently. On the other hand, Internet interventions can develop as well, and might at least for some patients be more suitable than face to face CBT. As many health conditions such as chronic pain and cancer require a multidisciplinary team approach for optimal treatment, we assume that future Internet interventions will take advantage of this possibility. There is no consensus yet among researchers about the way CBT should be presented on the Internet, although standards are emerging. Most interventions used a guided self-help format in which the treatment protocol is presented on the Internet and the patient works it through more or less independently. The patients are supported by brief contacts with therapists through e-mail or telephone. However, other studies use a more traditional format in that the patients go online at the same time as the therapist and have a more or less regular treatment session. Group treatments can also be delivered in such a way. Another difference between interventions concerns the additional elements on the Internet, apart from CBT. Some interventions have combined the cognitive behavioral interventions with other components, such as psychoeducation, films and texts to read, and a forum for users of the website. Other interventions do not provide such extras. Our review showed up several other important limitations of the current research in this area. First, most studies used waiting list control groups, and only very few used a care-as-usual or another control group. Subjects in waiting list control groups probably do not take constructive action to reduce their problems themselves during the waiting period, because they are expecting professional help in the future. This may result in an overestimation of the effects of an intervention, because there may be less spontaneous recovery. Second, most studies recruited participants through the community and through other websites. This is not a problem for interventions that target the general population. But when such an intervention is effective this does not automatically mean that it is also effective in clinical settings. Subjects who are responding to community recruitment are probably very motivated which may improve their results compared to subjects who receive treatment. Third, none of the twelve identified trials compared Internet-based treatments to face-to-face or other treatments. This is, however, an important issue, because only direct comparisons can give evidence about the comparative effects of Internet-based treatments compared to more traditional treatments and the type of patients who can benefit from it. Fourth, most studies were aimed at adults. Only two studies were aimed at children and adolescents, while these groups are probably the most familiar with the Internet. None of the studies were specifically aimed at older adults, while they suffer most from health conditions. Future research should focus on these limitations of current research. More studies are needed with care-as-usual or other control groups, clinical recruitment strategies, comparisons with face-to-face treatments, and children or older adults as target populations. More research is also needed to examine how CBT should be presented on the Internet, and to examine reasons and solutions to the relatively high drop-out rates in several studies. Finally, it is also important to study how Internet-administered CBT can be integrated in stepped-care models of care. This review has several limitations. First, the number of included studies is still very small. And the number of studies examining specific health problems is too small to integrate the results of these studies statistically into a meta-analysis. Second, the quality of the included studies is not optimal. Third, the drop-out rates reported are high in some studies. This is a concern for this type of intervention, as patients can very easily withdraw from the intervention. Remarkably, the studies in which more traditional therapies (live sessions with therapists) are delivered through the Internet have the lowest drop-out rates. Despite these limitations, however, there is no doubt that the number of studies in this area will increase considerably in the next few years, while the promising results of the studies in this review indicate that the Internet will assume a major role in the delivery of CBT to patients with health problems.